Happy Monday, y’all! If you’ve been with me for any length of time, you’ll know I have a special fondness for grid-based tangle patterns. Grid tangles fill a section of your tile easily and there is something very mindful about it as you focus on repeating the same stroke in each grid square while turning your tile. And the tangle develops before your very eyes in an often-surprising way. Waax is a versatile grid tangle from Minnesota CZT Esther Piszczek and though it’s been a while since we shared her fun C-bun tangle, it’s time for a new one. I discovered it when I was playing with DL Sunray by Donna Hornsby, CZT, while preparing to teach a class. I asked myself, I wonder what would happen if I added a “sun” to the opposite corner of my grid and the rest flowed from there. I am especially enamored with the variations I discovered and how easily the original tangle, Waax, can be transformed into something completely new. My tip for drawing it is to notice that the inner, concave lines do not meet-up with the borders of the suns in the corners, unless you are drawing the one variation where it is a required part of the pattern. I named it Waax because I thought it looked like dripping wax when complete. Enjoy. I chose one of Esther’s variations (#3) for my example. Both Waax and DL Sunray owe their origins to the Zentangle-original tangle, Beelight. CZTs might recognize the Beelight variation Maria includes in our (CZT-only) Zenthology. 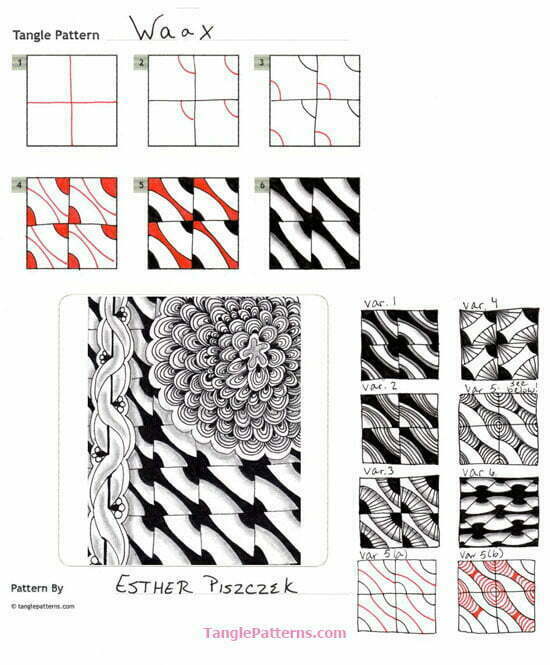 Esther illustrates the step-by-step instructions for drawing Waax below and she has gone above and beyond by showing us several ways to vary her tangle. Going to have to try this tangle, very interesting and love the variations. I love the way the grid disappears into the final design. Thank you, Esther, for drawing up so many tangleations! Thank you for sharing. I can’t wait to try this and all the variations too. Interesting. Looks fun and not too difficult for a newbie like me. The tanglations are great too. Thank you! So creative! We always need fillers and this pattern gives us many options. I love it! Thank you for sharing. The variations are what sold me on this very creative pattern. The possibilities are endless. Thanks for sharing! Thank you for sharing this. I am really impressed with all the variations and have tried them all. Also love C-Bun.